Always cheaper, basic with no frills but you can always rely on a warm welcome. If you’re religious there may be an evening mass but if, like me, you’re not, it won’t be pushed down your throat, the welcome is open to everyone. From Cizur Menor the 300 metre climb up to Alto del Perdon warms a chilly pilgrim. A nearby spring called the Fuentes de Teja is where the devil traditionally offers the thirsty pilgrim a drink, but only if they renounce God, the Holy Virgin, or at the very least St James. In 1996 a sculpture was erected here of a pilgrim caravan, just before the scenery opens out to views of the route laid out before you. El Camino is clearly visible winding away into the distance and threading together several villages such as Uterga, Muruzabel and Obanos. It’s always windy up top and today storm clouds bubbled up and threatened but thankfully, didn’t deliver. The scent of aniseed stayed with me for most of the day as the plants grow wild here, it smells wonderful, even if I don’t like the actual taste. Puente la Reina gently cradles the pilgrim on arrival. 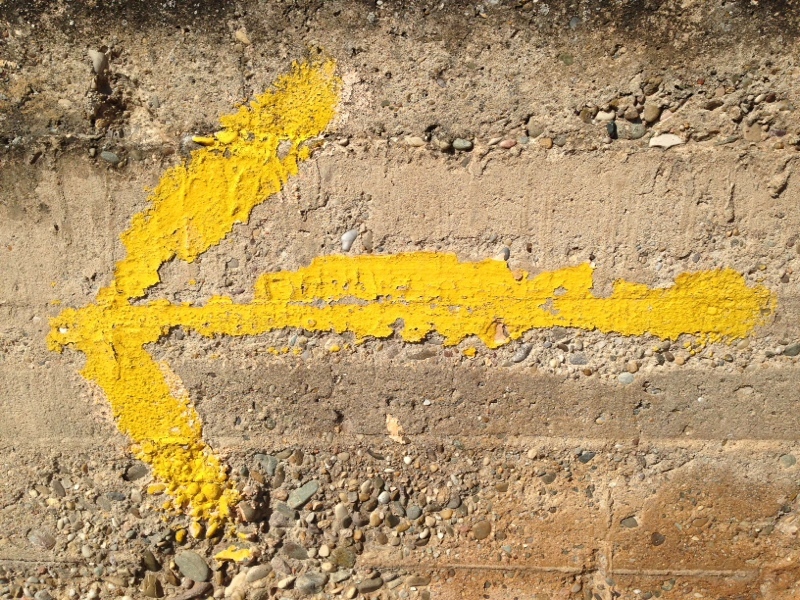 The Camino takes a line straight through the town, as it has done since the 11th Century. 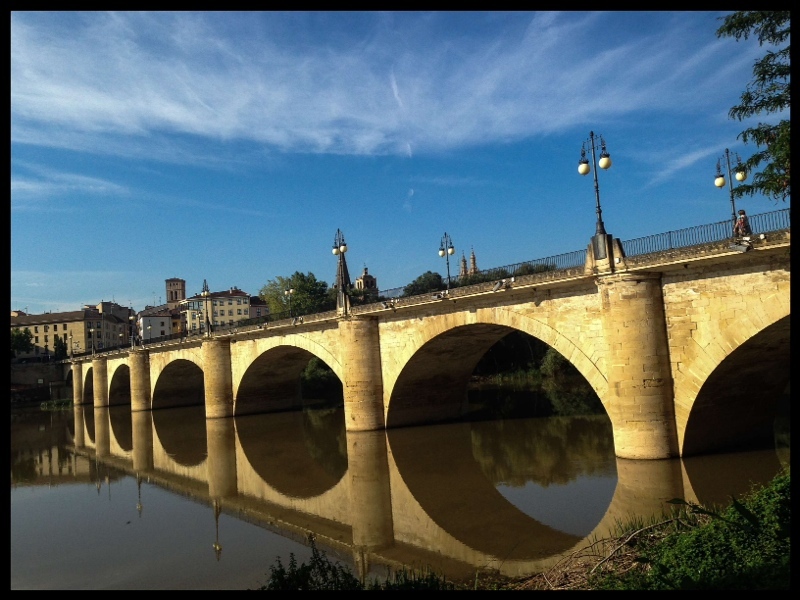 The narrow, shaded main street leads through to the beautiful, arched bridge spanning the River Arca. Buy some lunch, take it down to the grassy bank and enjoy. It was a tough day today. 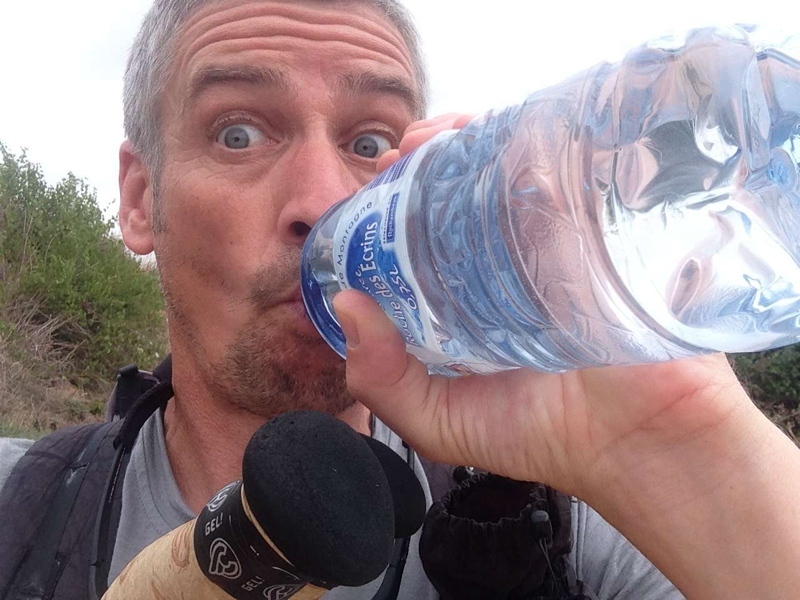 The heat sapped most of my energy and some days 25 miles just seems to take ages to arrive. I pulled up in Estella where all of the Albergues were full and a helpful warden directed me to the suburb of Ayegui where thankfully, space was still available. A dormitory of around 40 others is not unusual and after dreaming of fruit all day and forgetting to buy some, in true Camino spirit, I was offered a couple of slices of juicy water melon courtesy of Hans from Holland. The Bolero gently piped over the speakers at 6am, softly suggesting we wake up and be on our way. I hummed it all day (and still am as I write). For once, the morning was cool, overcast skies seemed to have obliged my wish for some respite from the sun. 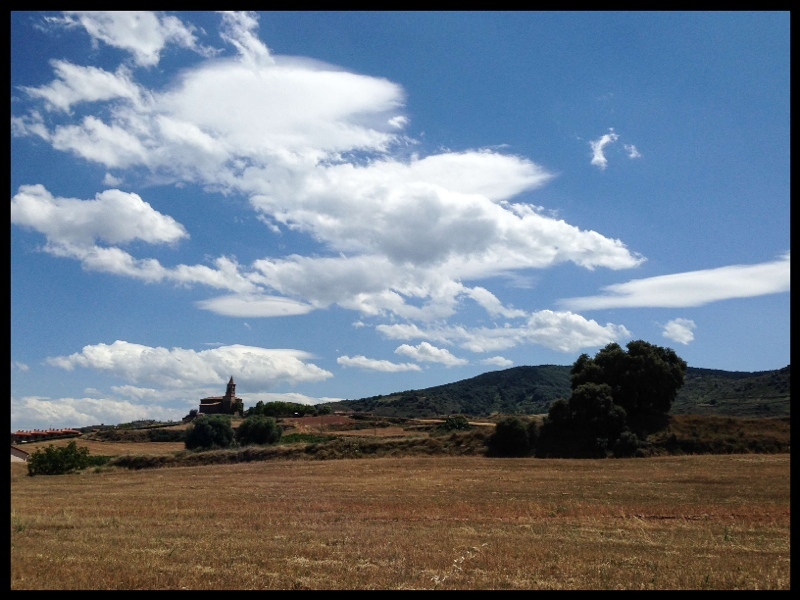 Leaving Estella and stopping briefly in Azqueta for a cafe solo, the afternoon offered wide, open spaces with few pilgrims. 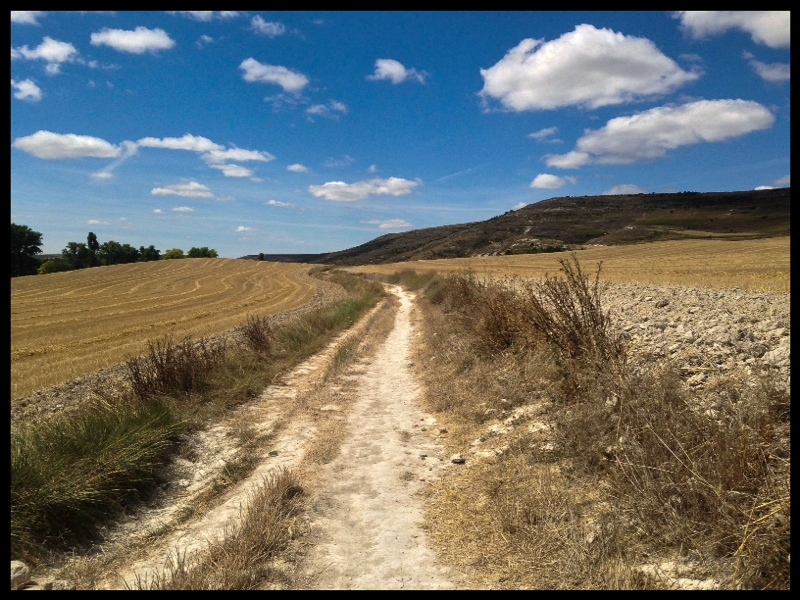 August is proving to be quiet on the Camino. 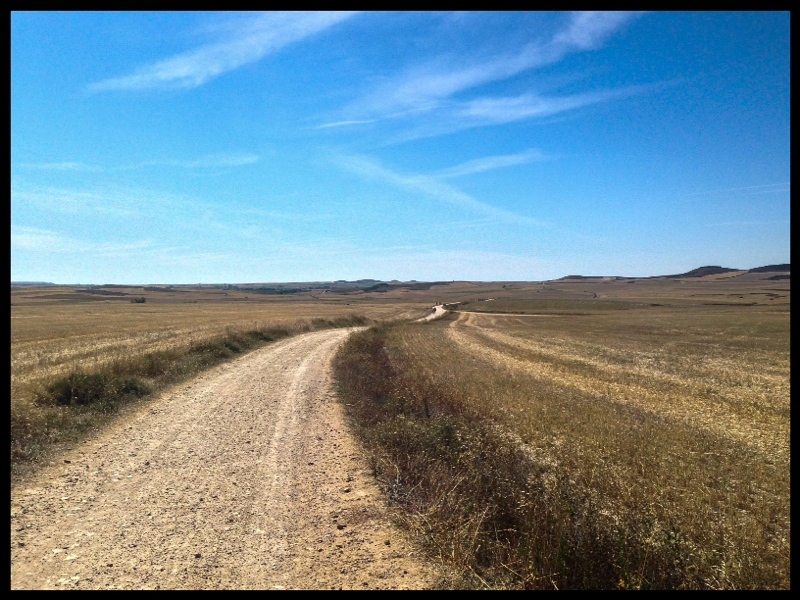 Prior to the busiest month of September, I’m guessing that the fierce sun keeps many walkers away but if you can stand the heat, it’s worth planning your hike for now and enjoying a less crowded Camino. Los Arcos always keeps a pilgrim guessing as to its whereabouts. The track cuts a line through the base of a wide valley, the occasional, old abandoned building keeps a devout sentinel on either side. Hidden by a hill, Los Arcos finally appears nestled in the bottom of the next valley, it’s small eateries and bars catering well for the pilgrim. You can bring a map through Spain. Or follow these things. Further, expansive views were on offer in the afternoon. 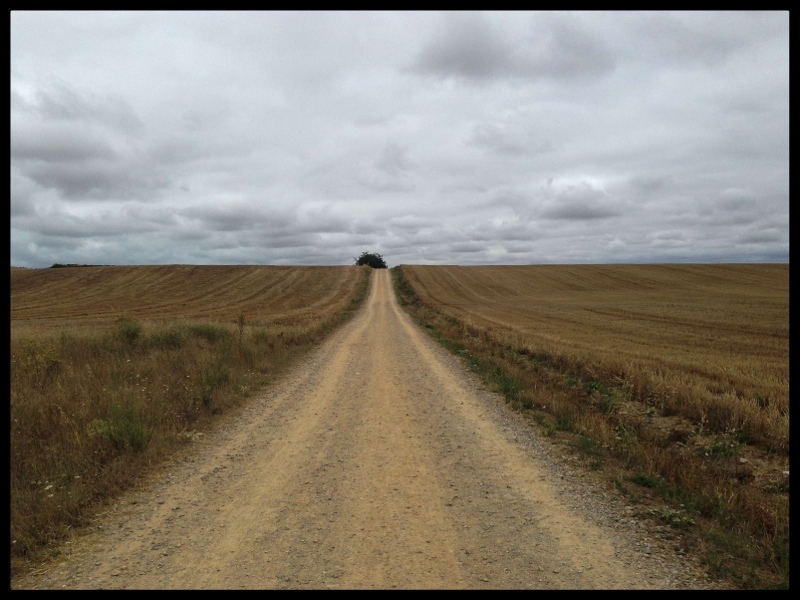 The 100 mile stretch between the cities of Burgos and Leon, still a couple of days away is known as the Meseta. An area of huge plains and epic skies offering little shade and the towns are a long way apart. I always considered the two days prior to the Meseta from Azqueta as the warm up, a gentle reminder that the going is about to get a lot harder. 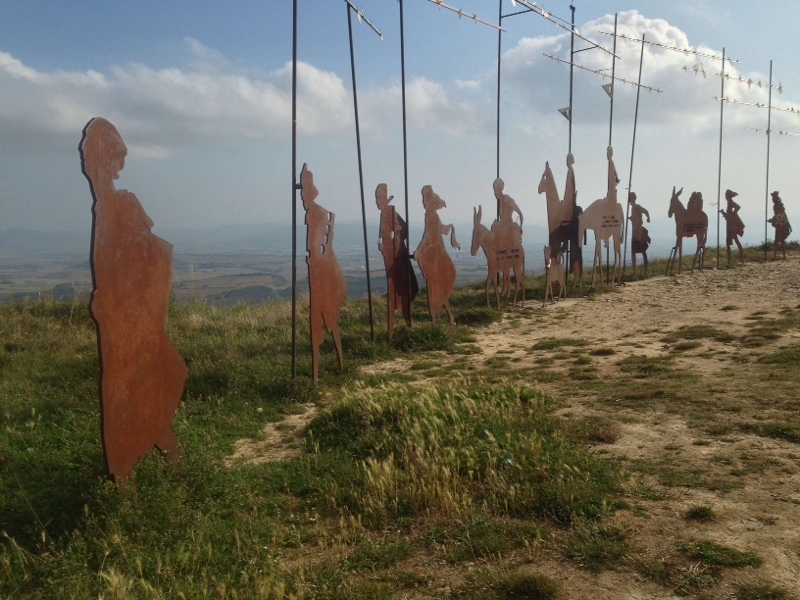 Viana, perched in a commanding position overlooking the city of Logorono appeared 2 hours before I reached it. I had not stayed there before but it has imparted lingering memories. The small town centre is quiet as I pass, looking for the Albergue Andres Munoz, tucked away down a side street near the ruins of the Iglesias San Pedeo. The locals don’t emerge until around 8 in the evening, then they eat and drink to their content after the heat of the day. I squeeze in the dormitory room, sharing with seven others, all Italians. The room is stifling, a weak breeze drifts over the front, open wall. I try to unpack without disturbing them, all taking an afternoon siesta. As usual, albeit cramped, the Albergue is large and well kept. There are far more places to stay on the route now than when I first walked the way in 2002. Private accommodation has sprung up everywhere but the real gems are still those run by the local church groups. Open to all, they are basic, clean, and expect nothing more than a donation according to what a pilgrim can afford. Some offer communal evening meals, a chance to meet a few of the others and if prayer is your thing, many will accommodate some sort of service in the evening. I always prefer these places, they hold some great memories. Logrono, a large metropolis, shimmers in a heat haze already at 7.20am as I ascend out of Viana. The vineyards have started to appear now, wine has been produced for at least 2,000 years since the Romans brought vines to the upper Ebro valley. The grapes are just turning to reds, peeking out from vivid green leaves, stark in contrast against the red soil and blue sky. Still falling down to the city, I pass the small house where Doña Felisa used to sit outside in the shade stamping pilgrim’s passports. Sadly, she died in 2002 at the age of 92 but her daughter carries on the tradition. The beautiful inscription left in your passport reads ‘Higos – agua y amor’ (figs – water and love). It’s still early and being Sunday, eerily quiet as I reach the outskirts of Logrono. 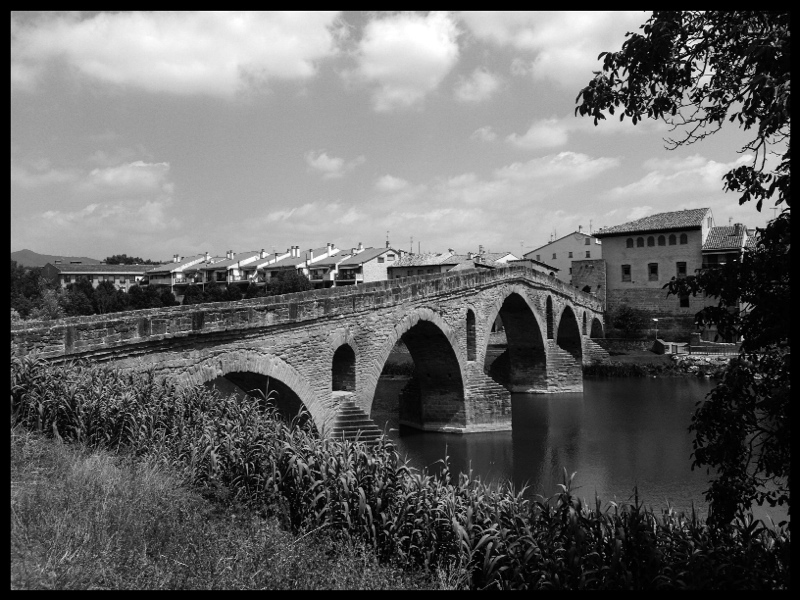 I cross the wide Rio Ebros over the Puente de Piedra and turn right, skirting the centre to the south. The streets glisten from cleaning and I find my way through a quiet city, stopping for a coffee and a tortilla. A stretch of eight miles leads me into Navarrete for lunch. I buy fruit at a small shop just before it closes and sit by the fountain, filling my water bottle. It’s busier now, many families have gone to church and children play around the centre. I continue through the heat and dust from Navarrete, slowly climbing until the top of the Alto de San Anton where the views drop away once more until the next hills, at least a days walk away. Vines sweep away either side in parallel lines, a lesson in perspective. Najera, my destination for the day, is a sweet little town. A swathe of grass cups the clear river and a few bars line the sides. The Albergue Puerta de Najera only has one bed left and it’s the top bunk. I hate the top bunk, I can never sleep up in that altitude so I decline and take my chances at the newer Hostal. It proved a good move, eager to impress, they have no bunks, it is spacious, quieter and half empty. I secure a bed next to a window, sure of a cool breeze through the night. I’m starting to understand the siesta. The Spanish escape the heat of the afternoon and become recluses for a few hours. With a few exceptions catering for pilgrims, bars and shops close from just after lunch to late afternoon. The clatter of shutters rolling down over windows heralds Spain going to sleep. One such example is the sleepy village of Azofra. In a scene from a post apocalyptic set, all is abandoned. As I pass through the streets, the heat bounces back off the buildings, turning the little hamlet into a corridor of furnaces. A door creaks open to my right and an old lady appears, shielding her eyes with her hand and looks at me. The expressions of the old Spanish women offer few clues, they eye you up curiously with little emotion. And then, a slight nod of the head, perhaps a weak smile and a ‘Buenos Dias.’ It’s like a ghost town, nothing moves except the odd dog appearing from nowhere and passing with a wide berth. I always wonder if anyone lives in such places. Santa Domingo de la Calzada finally appears, the church spire towering over the town. I pass the Albergue where I first stayed in 2002 and peer in. A few boots line the rack holding clues as to how many are already booked in. I am taking a half days rest in the hotel, a treat for me, time to unwind a little after 140 miles in just over 5 days. I lie on the bed in a blast of air conditioning and wait for the sweat to subside. A few calories at the local restaurant with a glass or two of Rioja and I’m done for the day, sleep comes easily.